Neil Young’s “I’ve been a miner for a heart of gold” of the 1970s runs true for classy and elegant gold trinket lovers until date. No matter the number of years gone by, the timeless sparkle of the gold ornaments designs entices one’s mind. It holds true for celebrities as well. A highlighted list of celebrities got married in the last decade. Like the various other accessories and attires, the jewellery they wore created quite a storm. 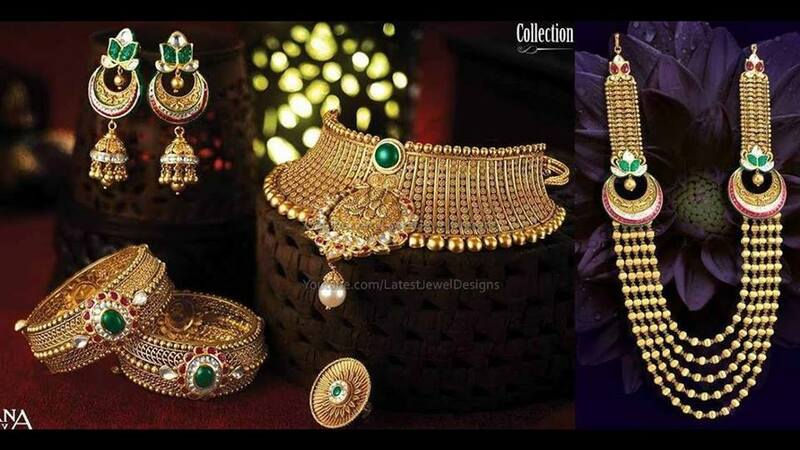 Now, every client wants those trendsetting pieces of jewellery and wear them on their special day. If you are a bride-to-be, then check out these elegant pieces and avail them to stand out from the crowd. 1. Esha Deol’s Matha Patti – This celebrity’s matha patti made her stand out from all the brides of that year. The jewellery was studded with rubies and bejewelled her look. 2. Shilpa Shetty’s Bajubandh – The sensuous celebrity managed to charm her fans with the additional stunning peacock-shaped bajubandh with emerald drops. If you are planning to go with fewer bangles, this jewellery on either hand will take your look to a new level of fashion statement. 3. Vidya Balan’s South Indian heavy neckpiece – The South beauty went utterly simple yet royal on her wedding attire. The heavy necklace adorned her neck and dazzled her fans. In case, you are not a huge fan of crowding yourself with numerous ornaments; this is a perfect choice to be availed on your D-Day. 4. Bipasha Basu’s Haath Phools – The Bong beauty got married looking like a picture-perfect bride. The impressively beautiful bride gave her followers a major goal with her pearl and polka studded gold haath phools. 6. Kundan Sets – Celebrities have paved the way for their followers and have shown how added colours of studded emerald, ruby, diamond add on to the glamour quotient. Hence, the popularity of the kundan sets amongst the brides-to-be. The kundan sets are available for all kinds of gold ornaments designs – be it maang tikka, earring, neckpiece, earring, or kamarbandh. 7. Sonam Kapoor’s Customised Golden Mangalsutra – Sonam Kapoor already had national and worldwide followers because of her style statement. That she will start on a new trend with her jewellery pieces is no surprise. The customised mangalsutra with diamond studded star signs of the duo and solitaire in the centre is one trend that is going to have a vast follow-on. The celebrities have given some significant goals for gold ornaments designs to the upcoming brides. These jewellery will definitely be carried on in the next wedding season. Therefore, if you have marriage on your charts for this year buckle up and get yourself ready to look royal and elegant. You can add on a few tweaks to create a unique style of your own. People do opt for diamond and pearl sets at times. However, gold is a timeless crest of treasure and will forever remain so. So, let gold have the graceful scope to enhance your beauty on your D-Day because nothing does a better job! Shop and gift yourself a perfect Wedding Day!